Apart from counting words and characters, our online editor can help you to improve word choice and writing style, and, optionally, help you to detect grammar mistakes and plagiarism. To check word count, simply place your cursor into the text box above and start typing. You'll see the number of characters and words increase or decrease as you type, delete, and edit them. You can also copy and paste text from another program over into the online editor above. The Auto-Save feature will make sure you won't lose any changes while editing, even if you leave the site and come back later. Tip: Bookmark this page now. In addition, WordCounter shows you the top 10 keywords and keyword density of the article you're writing. This allows you to know which keywords you use how often and at what percentages. This can prevent you from over-using certain words or word combinations and check for best distribution of keywords in your writing. In the Details overview you can see the average speaking and reading time for your text, while Reading Level is an indicator of the education level a person would need in order to understand the words you’re using. Disclaimer: We strive to make our tools as accurate as possible but we cannot guarantee it will always be so. Keep track of the number of words you write each day using the activity button. This button helps you clean up your document by removing funky characters, unneeded new lines, etc. Step 1. What do you want to say? Step 2. Where do you want to share it? Step 1. What do you want to share? Step 2. What do you want to say? Step 3. Where do you want to share it? Click the upload button below to select a text document. Supported formats are PDF, TXT, DOC, DOCX, ODT. You can turn on or off different counting options here. You can turn on or off different buttons provided for different functionalities. ACTIVITY Keeps track of your word and character count. AUTO-SAVE When turned on, WordCounter will automatically save your document every 30 seconds. You can then switch back to previous versions of your document at any time. CASE Gives different case options. Applies to your entire document or only the text you select. CLEAN TEXT After pasting a document into WordCounter, this will clean it up by removing invalid characters, word wrapping issues and unneeded new lines. CLEAR Delete all of the text in your document. DOWNLOAD Download your written text (PDF, TXT, DOC) to your device. FIND AND REPLACE Find and replace any words or sentences you want. GOAL Set writing goals (such as 500 words) and WordCounter will let you know when you've reached them. You can also share and embed your goals. PRINT Print your document quickly and easily. 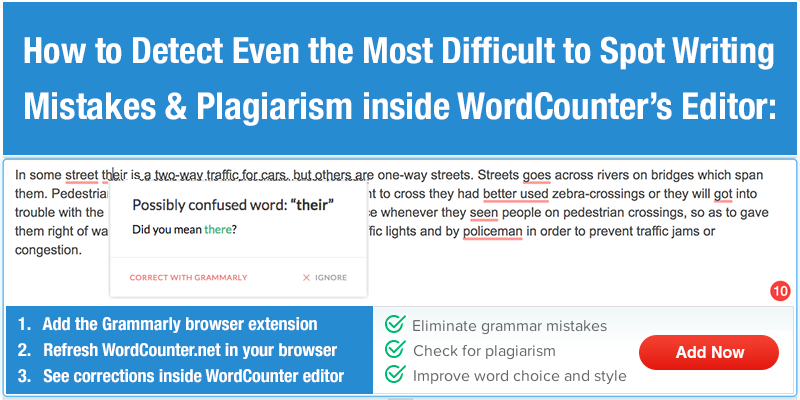 PROOF READ WordCounter reads your document back to you. Make sure to turn up your volume! REDO Redo your last changes. Click multiple times to redo multiple changes. SAVE Saves your text for later retrieval. Be sure and click the SAVE button each time you want to save. SAVE TO DRIVE Saves your document to Google Drive. Great for backup purposes. SPEED Use a timer to see how fast you're typing. 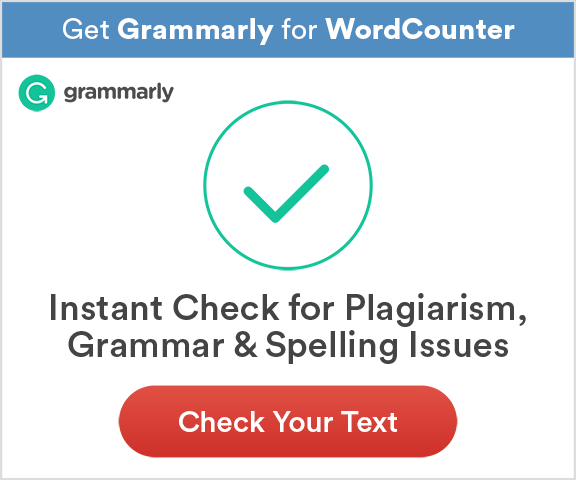 SPELL A powerful spelling and grammar checker for your document. TALK TO TYPE Speak into your microphone and WordCounter will type for you. THESAURUS Select (with your mouse) a word in your document and click the thesaurus button to get a list of synonyms. UNDO Undo your last changes. Click multiple times to undo multiple changes. UPLOAD Upload your existing document (PDF, TXT, DOC, DOCX, ODT) into WordCounter. Enter the number of characters, words, sentences or paragraphs you want to set for a goal. You can set, delete and edit your goals. Here you can build your very own goal progress bar that you can put on your website, blog or in your signature on other websites. Choose a size and color, then click Save. Finally, click the View Code button to get your code. Record your count of words and characters. You can edit and delete your records. You can load, edit and delete your documents.